The Evolution Hammock has an open style with a gathered-end build, but is really a hybrid design due to its integrated insulation. The Evolution includes both top and bottom full-length insulation using high-quality down. The top quilt is 80 inches long. The baffles are latitudinally aligned across the hammock. 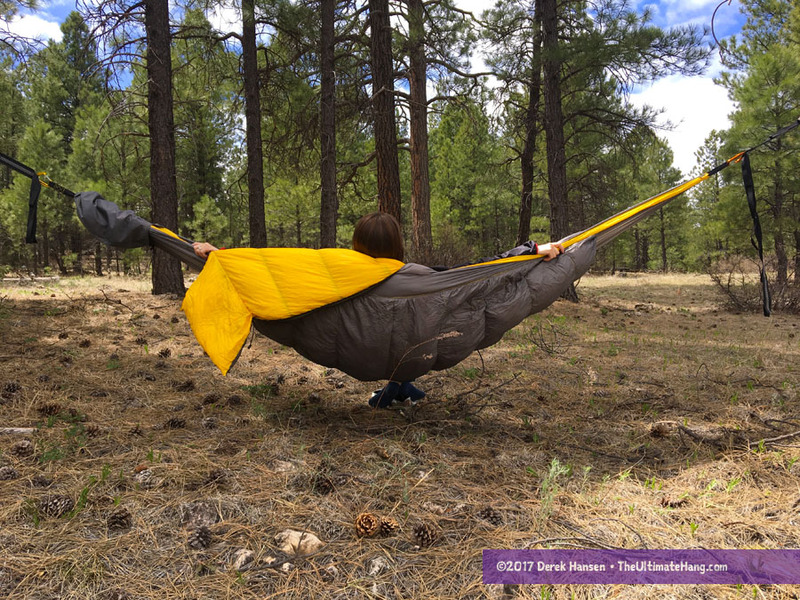 The hammock focuses on lightweight materials and the entire kit, including titanium hardware, Amsteel suspension, and polyester straps hovers around 3.5 lbs (1.6 kg). The ends of the hammock are gathered together with webbing loops. The fabric is a 1.0 oz 20D HyperD diamond-ripstop nylon. Shock cord to cinch up the head opening on the top quilt. With shoulder draft tubes deployed, the head area is fully sealed. Foot box of the top quilt showing the center zipper. Close up of end channel. The insulation is sewn into the hammock body fabric. The top quilt features a center zipper and has two draft chambers that seal the quilt around the head and shoulders of the occupant. The hammock comes complete with a bishop-style stuff sack (similar to a double-sided sack) and a polyester storage bag. The Evolution Hammock is scheduled to launch on Kickstarter in May 2017. I think the weight was the first thing that impressed me about the hammock. The complete kit is remarkably light for a full-length quilt and hammock combo. When packed, the bishop bag compresses roughly the size of two loaves of bread. It’s a tight fit. Once deployed and fully lofted, the hammock really comes to life. Accent trim fabric lines the edges of the hammock and the same color is used to line the inside of the hammock providing a striking color combination. The titanium carabiners and daisy chain Amsteel loops make set-up pretty easy. To get an optimal lay in this hammock, I had to hang the foot end higher so my torso would be aligned better in the insulation and provide the best room for my feet. Final production models will feature an 80-inch-long top quilt. Laying diagonally is easy and can be done on either direction. The zipper pulls easily and has a stopper to prevent it from catching or fully releasing. The center-aligned zipper is really ideal for a hammock. It’s easier to enter and exit and get the insulation situated. The designers also thoughtfully added baffles around the top that completely seal the shoulders. It’s a great concept that I think works well. I feel this hammock is really targeted at weight conscious backpackers. For these folks, switching out to a preferred suspension type is easy. In fact, some additional weight can be saved by eliminating the carabiners and going with a simple strap and Becket Hitch system. The prototype model I tested was very warm. I’m not sure if other models will be released with varying warmth ratings, but what I’ve been testing could easily be used in the winter. Of course, additional insulation can be used if you want to go to more sub freezing temperatures. The only flaws I saw were topical and related to the prototype model I was reviewing. Suspension and Anchor System ♥ ♥ ♥ ♥ ♥ The hammock includes high-quality Titanium carabiners, straps, and lightweight suspension lines. Construction and Craftsmanship ♥ ♥ ♥ ♥ ♥ High-quality construction and materials used. The prototype I tested has some production flaws and inconsistencies that are expected. Modularity ♥ ♥ ♥ ♥ ♥ Insulated hammocks benefit from secure, “managed” insulation, but this makes it a little hard to use the hammock in multiple seasons or situations. Price and Value ♥ ♥ ♥ ♥ ♥ Good price for combo top quilt, bottom quilt, hammock, and suspension. What is the anticipated price point? I watched the video and it looks impressive. Kudos to the wife who sewed it up. The price is close to bone fires but bone fire offers something really versatile as well with a complete jungle hammock and tarp solution. I’ve been wanting to make my own seen on quilt hammock for a while. This one looks great. So, no bug netting? No tarp?